Enter Air as the largest charter airline in Poland and the second largest airline in the region is concerned by its passengers’ well-being. It provides charter flights mostly to tour operators and direct customers at very competitive prices to more than 80 of the most popular holiday resorts in Europe, Africa and Asia from Poland, Czech Republic, Scandinavia, France and UK. 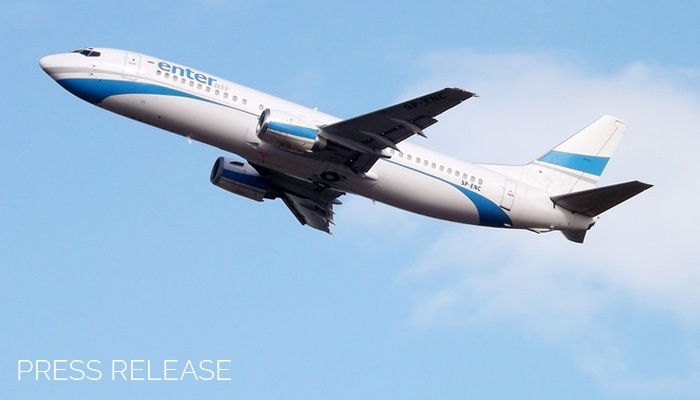 Founded in 2009, Enter Air’s first flight was in April 2010 and today the company operates eight Boeing 737-400 and six 737-800 aircraft. Safety, security as well as respect of the environment are the foundation and values of Enter Air’s business. For four years running, Enter Air has been selected as the best charter airline company in Poland.